Hardback. 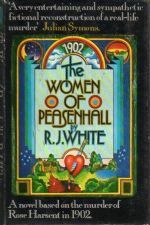 A novel based on the murder of Rose Harsent in 1902, for which William Gardiner was accused and subsequently acquitted. An entertaining and sympathetic fictional reconstruction of a real-life murder. 159pp. small 8vo. h/back. From the library of true crime writer, Wilfred Gregg, with his personal b/plate. Browned pp. o/w Vg. in Vg. pcdw. which has signs of label removal to 'blurb'.